The Quest Spectrum Ring Light is attached to the Quest Spectrum Camera during open surgeries. The Quest Spectrum Ring Light is a sophisticated lens surrounded by an eight-piece Ring Light. 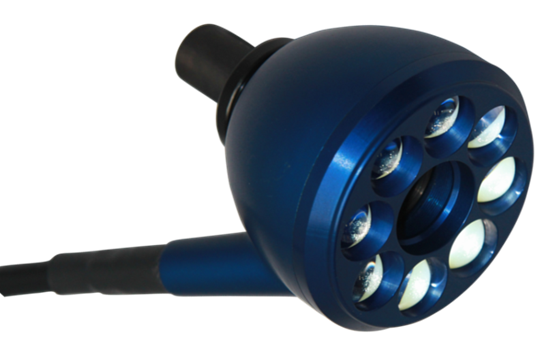 The eight-piece Ring Light has an integrated light cable which connected to the Quest Spectrum Light Engine. This design is used to optimally illuminate the targeted area of the patient. Light reflected and emitted by the patient is projected to the Quest Spectrum Camera with minimal chromatic aberrations. Quest Medical Imaging has developed two Laparoscopes that can be used for minimally invasive surgeries. 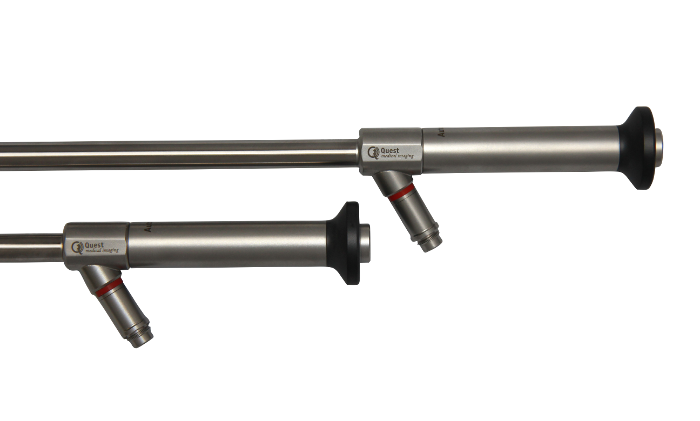 These Quest Spectrum Laparoscopes have a field of view of 60° and are available in the configurations of a tip angle of 0° and 30°. Quest Medical Imaging puts a lot of effort in minimizing the patients’ risk during surgery. Therefore, custom drapes have been developed for open and laparoscopic procedures with the Quest Spectrum Platform. In open procedures the Quest Spectrum Ring Light and the Quest Spectrum Camera are draped together. The Quest Spectrum Laparoscope can be sterilized by using commonly available autoclaves. In case you would like to know more about our drapes or the methods that can be used to sterilize the Quest Spectrum Laparoscope, or one of the other Quest Spectrum products, please contact us.